Making Bikram Yoga Truly International (and good). If a yoga teacher brought a fabulous system of postures to Boston and taught in Hindi or Japanese, would it succeed? Here in Thailand, Bikram Yoga has been struggling to gain a foothold. Studios using the Bikram business model have closed. I believe the problem is two-fold: yoga classes are too expensive and the classes are in English. Modern Hot Yoga teaches the Bikram method in a small studio keeping costs down. Two impressive women are now developing the hot yoga curriculum in their own language. 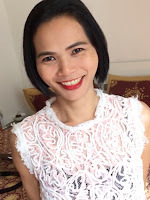 Bua Khao (darker hair) is leading the effort to bring postural yoga back to Thai people. Tak is our newest dedicated trainee learning the postures. Bua Khao and Tak are also beginning classes for kids in Thai. 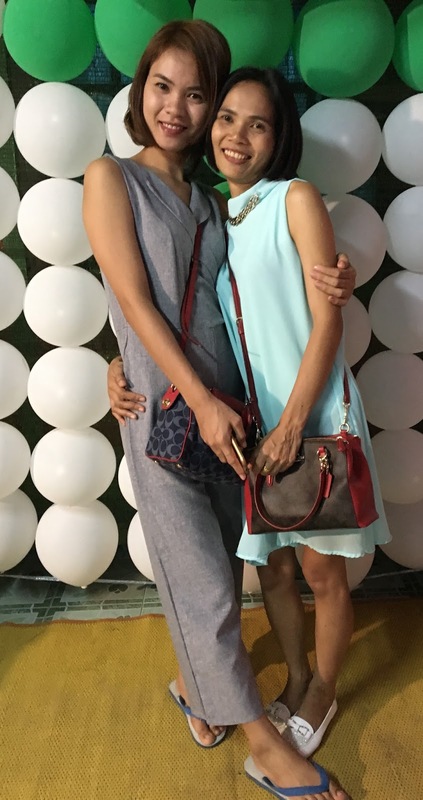 These two hard working women are the future of Modern Hot Yoga in Thailand. Did I say bring postural yoga "back"? 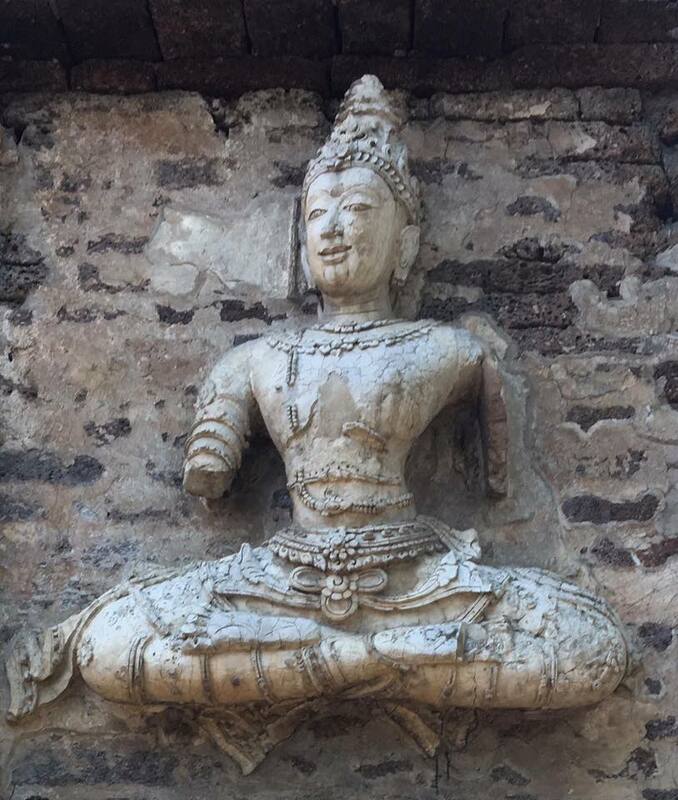 This image of a Thai lady in Lotus Pose was sculpted in the mid 1400s. The sculpture was created by the Lana people and can be found in Chaing Mai, Thailand at Wat Chet Yat. Economic growth in Southeast Asia has created a rising middle class and a market for yoga classes. But there are many people here in Thailand that need work too. Modern Hot Yoga's mission is to bring inexpensive Hot Yoga classes to Thailand and create employment and business opportunities for Bua Khao, Tak, their family, friends and countrymen. 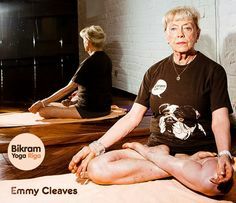 Come to class, you'll experience world class Bikram Yoga for sure. A 200 Baht ($6.00 USD) donation per class supports our trainees. No money? No Problem. Come anyway. If you can, donate. In Singapore people such as retired hedge fund managers drive taxis. It gives them something to do. Singapore has the best taxis in the world. In every other city in the world there are varying degrees of service, competence and larceny in the world of taxis. Ho Chi Minh City is an example. When arriving at the international terminal of Tân Sơn Nhất Airport in Ho Chi Minh City, arriving visitors are greeted by a variety of overpriced kiosks, touts and sketchy taxis at the curb. 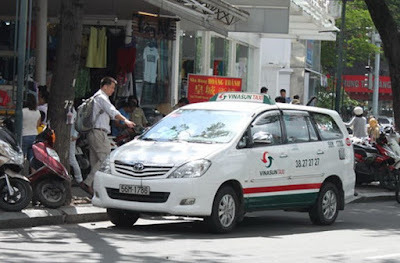 Where are the Vinasun Taxis? So where are they at the airport? The Vinasun taxis line up at the domestic terminal. When you leave the international terminal go right. After a short walk you will come to a left turn on the walkway and a few steps later find yourself in front of the busy, new domestic terminal. Cross the several lanes of traffic in front of the terminal (on your left) to the last island where the taxis cue. Ignore the many touts seeking to guide you to one of the many brands of taxi and ask for, or simply walk up to, the nearest Vinasun Taxi. Twelve years ago I was in Los Angeles assisting at Bikram Choudhry's hot yoga teacher training. I was a recent graduate of the training returning as a visiting teacher. The yoga sequence we taught consisted of twenty-six postures. But there existed an advanced series of eighty-four postures that I was eager to try. I attended my first advanced series yoga class surrounded by people who were really, really good at it, bending their bodies into fantastic postures. Then there was me. Technically, at the time, one needed to be a certified teacher to attend advanced class. On that count I qualified. Another requirement was the ability to get into, and hold, Lotus Posture, a cross-legged sitting posture. I could do that, barely. Prior to class I introduced myself to Emmy, Hot's Yoga's real leader. Emmy, now near ninety, practices often and leads advanced class. Emmy has a sardonic way about her. She assessed my skills and reluctantly admitted me to her class with a quip about not hurting myself. Emmy is also a flirt. I think that had more to do with her acquiescence. Truth be told, I was unqualified. But one has to start somewhere. As soon as the opening sequence begun, I knew I was in over my head, especially with this particular group of folks, some of the best in the world. Behind me a young guy stopped his own postures and would come and give me corrections. While I was terrible at advanced yoga class, one thing I had going for me is I can be stubborn. I was not giving up. Throughout the class the gentleman behind me continued to offer me assistance. What stood out about this man's assistance was his generosity. He had amazing skill at the postures, executing some of the ones impossible for me to consider with grace, style and excellence. My tutor seemed to know when I was capable of following along and would come and give me tips as to how to get into a posture properly. But there was something more to this man than simply knowledge of the yoga. He was outward focused. I suspect there were other students present that would have viewed me as a nuisance who did not belong. My new found mentor was kind. He was able to meet me where my ability could take me, and bring me just a little bit forward. There was something special about him. After class I looked for my new found teacher but he had left quickly, and I didn't even know his name. Later I learned it was Jason Winn. Over the years since, I've heard people talk about what a special person Jason was, especially since his tragic death. He was a beautiful looking Lad seemingly possessing the best attributes of both masculine and feminine, kind of a Greek God. And he was one of the best in the world at performing deep, impressive yoga postures. Had it not been for my brief, anonymous, encounter with this special person, I might consider the praise I hear for him as sympathy for an untimely passing. But I know better. Every once in a while we meet a person who has the ability to see us, to listen to us, to commit themselves to paying attention to what's going on with us. In my ninety minutes with Jason Winn I came away knowing he was such a person, a generous teacher, someone special. I've been practicing Hot Yoga for twenty years and teaching for twelve years. I owned studios in Massachusetts, The United States, and I have led classes in The Philippines; Singapore; Australia; Vietnam and Thailand. It's been a very fulfilling experience. 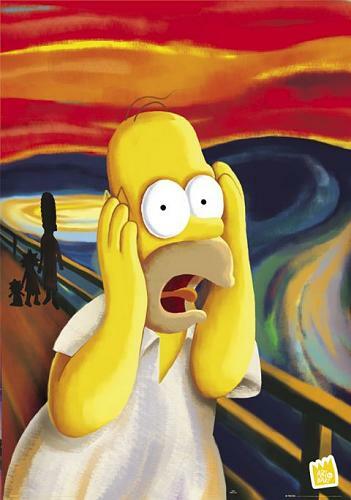 Imagine a young person applying for a job and the employer tells the applicant they must pay $12,000.00 for training. And when their training is complete, there is no guarantee the applicant will be hired. But it is exactly what happens in the hot yoga business today. It's time for a change. Modern Hot Yoga is a boutique studio in Bangkok. I will invite ambitious students to practice with me with the intention of training them to be teachers. As teachers develop, Modern Hot Yoga will employ or invest in the new teachers seeking to expand this social enterprise. Our mission is to bring the practice of hot yoga back to a simpler, less expensive model where dedicated, experienced teachers mentor new people in the art of Yoga. The price of our public classes will be low enough for everybody to afford also: 200 Thai Baht ($5.60 USD). No money? No problem! Come anyway. Postural yoga is a gift that's been passed down over generations, from many sources. It is the mission of Modern Hot Yoga to pass that gift on to the next generation. All the information you need is on: Modern Hot Yoga on Facebook. Take the BTS Sukumvit Line to Phrom Phrong station and leave the station via Exit 3. At the bottom of the exit stair make a U-turn and walk along Sukumvit Rd to Soi 43. Turn left on Soi 43. After walking about three minutes you will see the sign below on your RIGHT. Sixty-six steps past the crossing sign you will encounter the following sign on your LEFT. Go left! The studio is down the street on the left. 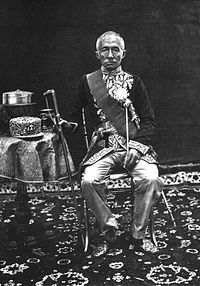 King Mongkut, known as King Rama IV, reigned in Siam in the mid 19th century. Today he's regarded as the father of science, having presided over an Enlightenment period in today's modern Thailand. However, not all of the good King's subjects were ready to embrace modern, rational ways. King Rama IV, made famous by the movie "The King and I". Visitors to Bangkok today arrive in large numbers at well known wats (temples) such as Wat Phra Kaew, wherein lies the famous Emerald Buddha. It is a beautiful, opulent place where believers seeking merit also go to make offerings to resident monks. 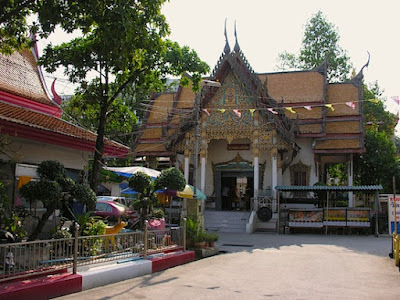 Far away from the tourists at Wat Phra Kaew, and the adjacent Royal Thai Palace, is a very ordinary Thai neighborhood Phra Kanong Nua in the Wattana district. Exiting the BTS skytrain at Phra Kanong station, my friend Buakaou, her sister Pear and I took a taxi to Wat Mahabut on the Phra Kanong canal. A narrow back street lined with shops leads to Wat Mahabut. Once inside the grounds - while vague, there is a discernible perimeter to the grounds - I had a feeling of stepping back in time. There are market stalls, some selling religious paraphernalia to worshipers. There are also food stalls, a massage shop and other merchants. Two main temples dominate the grounds alongside of a building where resident monks live. The wat is a living vestige of times past. It was easy for me to envision when this place was the center of the village, now a neighborhood of Bangkok, called Wattana. Buakaou and her sister Pear purchased baskets colorfully wrapped in cellophane and reminiscent of old style Easter baskets. Inside the baskets were everyday items such as soap, toothpaste and other necessities needed by a barracks full of monks. The ladies added a little cash in an envelope and presented the gift to a monk apparently assigned to accept offerings, allowing the faithful to participate in the Buddhist practice of earning merit. Then we sat cross-legged with about fifteen other people under a lean-to where a chubby monk chanted. The chanting monk used a bundle of wicker reeds tied together like a broom to sprinkle water over the worshipers. The ritual reminded me of Catholic priests similarly blessing their congregation with holy water using a fancier appurtenance. After the short service the ladies, and other folks present, purchased buckets of small fish and els releasing them into the water of the Phra Kaonong canal bordering Wat Mahabut. 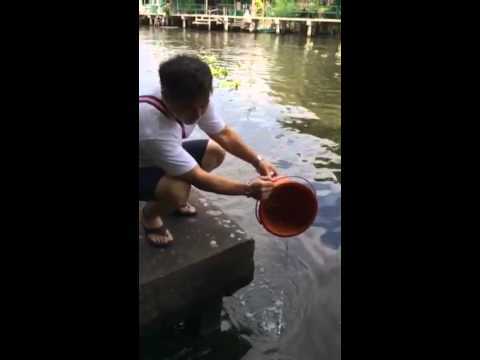 Releasing fish expresses gratitude and abundance. It's a practice that works, producing results in real life. Just two days later I witnessed two teenage boys struggling to lift a very large fish they had just caught from one of the many Bangkok canals. 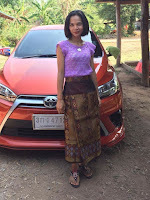 My experience at Wat Mahabut was not the same as visiting the big tourist attractions. There was something poetic about the place. It gave me a feeling a being connected to the world around me. The feeling for me was tangible and a little profound. Buakaou and Pear were not surprised by my experience. They told me it was a special place. 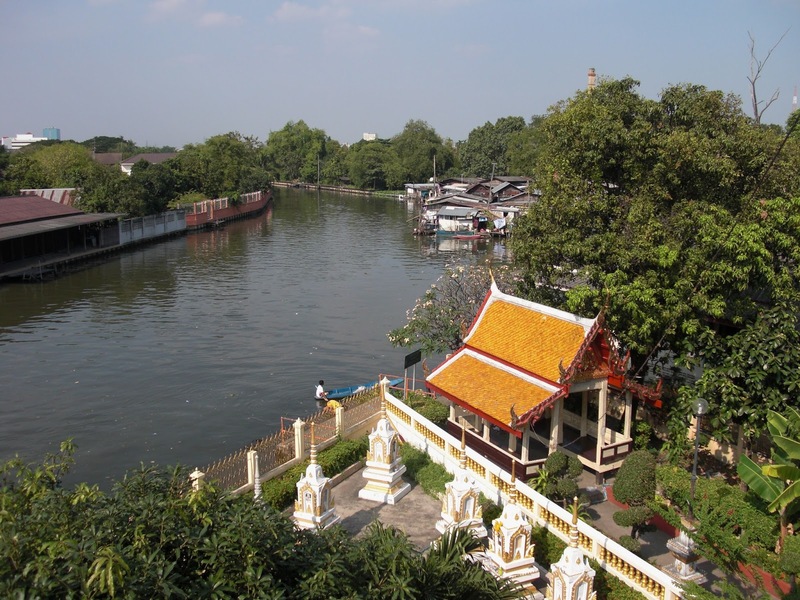 During the reign of King Rama IV a young couple, Nak and Mak, lived on the banks of the Phra Kanong Canal. They lived happily, Mae Nak being an ideal wife to the handsome Mak. 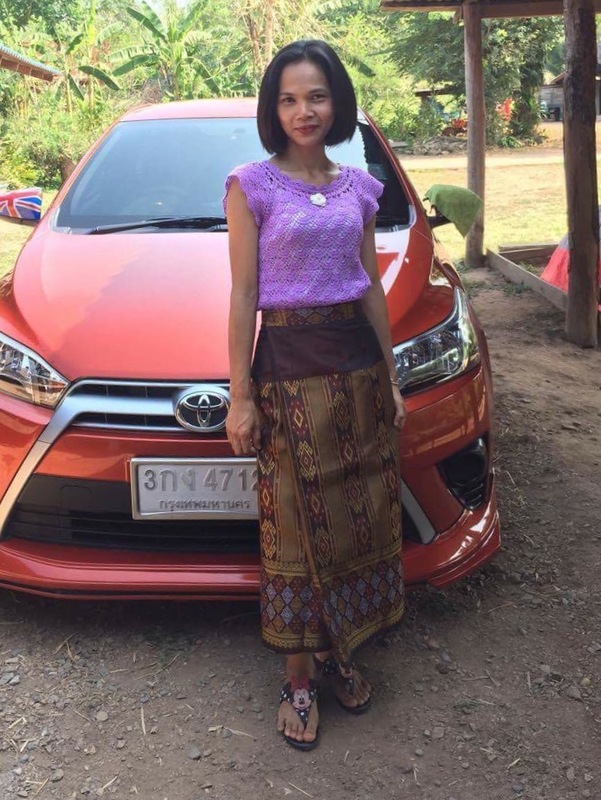 Mae Nak was beautiful, devoted and pregnant, expecting the couple's first child. Mak loved her beyond measure. Phra Kanong Canal today, not so different from Mae Nak's time. Mak was conscripted to fight against the encroaching Shan Tribe in Northern Thailand and was injured in the fighting, nearly dying. During Mak's slow recovery he dreamed about returning to his happy life on the Phra Kanong Canal. Mae Nak and the baby died in childbirth. But when Mak returns home Mae Nak welcomes him with great affection. They resume their happy life together. Mae Nak so loved her husband her spirit refused to leave. Alarmed that the unwitting Mak was living with ghosts, a few friends and neighbors tried to warn him. Mak could not understand why his friends would tell such lies. Infuriated, Mae Nak would steal into the night and kill the informers effectively silencing the town. One night while preparing dinner, Mae Nak dropped a lime between the floor boards. Now an etherial being, Mae Nak simply stretched her arm through the floor board and ten feet below to the ground in order to retrieve the lime. Working beneath the house, Mak saw the aberration, realized his wife was a ghost, and fled. The story has two endings. In one version a venerable monk from Wat Mahabut captured Mae Nak's spirt and imprisoned her in a piece of the skull from Nak's corpse. The relic today is kept by the royal family. 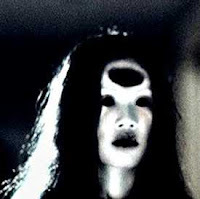 In the alternate ending, the monk captured Mae Nak's spirit and put it in a jar from which she escaped. Mae Nak's spirt roams Wat Mahabut still today. The Russian novelist Fodyouer Dosteesky wrote "The Idiot". I have a suspicion that the title translates a little oddly from Russian. Whatever! I discovered the book a few days ago. It's not a tome one reads quickly. But the overview is Fodyouer at one point in his life faced a firing squad for political dissent. He was reprieved at the last minute. Russian existentialists believed one can only appreciate the value of life if one has faced imminent death, as in a failed suicide attempt. I think ole' Fodyouer's firing squad experience qualifies. Dosteesky wrote the novel about a man who survives imminent death and spends the rest of his days seeing the good in life, life's possibilities and the spiritual value of nature. I am aware that there exists a predisposition for optimism vs pessimism. I am lucky to have been pre disposed to the former. I've always been able to find a positive path forward, always. Now there have been dark times in my life, some of them quite dark, and long. But even in the darkness, I knew I would find the light again. I'm under doctor's orders, as I write, to stay home and rest. I have mild bronchitis. I'd like to ignore the doctor's orders about staying in and resting and go meet my friend Cindy, who is visiting Bangkok from the Philippines. But I don't want to get her sick. My daughter Keri and old friend Eileen told me to behave. Okay ladies, I'll do as advised. But with not much to do, I'll be ranting on social media and writing blogs, you know, old guy stuff. But what to write about? Not much angst about. Hence my thoughts about "The Idiot". Not my favorite title, but it fits me. Fifteen years ago I was not killed at the World Trade Center. Given my job in the fire department, I got lucky. One of the dark times I just wrote about followed. But I found forgiveness, and now, like Dosteesky's Idiot, I am grateful for the gifts in my life, optimistic and happy. In life, Dosteesky was depressed. But I'm not a Russian existentialist, I'm The Idiot, or better still, I'm the Lucky One. Links to my blogs and other sites.